PRESS RELEASE – Liberty University earlier this month continued its march toward becoming a prominent collegiate athletics program by announcing the planned construction of a new baseball stadium next to its recently expanded Arthur L. Williams football complex. The construction of the new baseball stadium, which will cost in excess of $5 million, is the latest dramatic improvement to athletics facilities at Liberty in recent years. This aerial shows the site of the new baseball stadium between Green Hall (left) and the football stadium and soccer stadium. The new baseball stadium, which will seat about 3,000 spectators, should be completed well before baseball season in Spring 2013, Liberty Chancellor and President Jerry Falwell Jr. said. Until then, Liberty’s baseball Flames will be playing at their current home, Worthington Stadium, which will be converted into a softball stadium once the new baseball stadium is completed. Facilities for football, outdoor track, soccer and tennis have undergone significant expansions or facelifts since 2007. 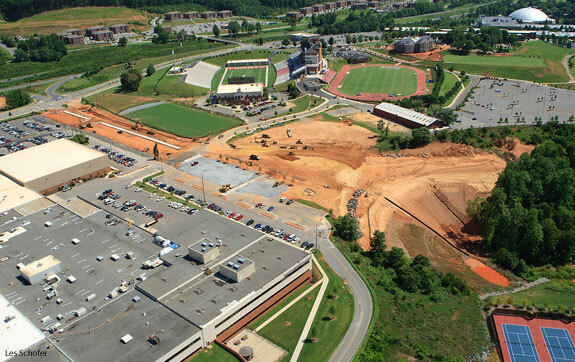 The addition of the new baseball stadium will enhance a developing athletics corridor at Liberty. Those athletics venues will serve as a buffer between Liberty’s primary academic-residential campus and its administrative-business operations center, which will be housed in Green Hall (formerly called Campus North) on the north end of Liberty’s main property inside the City of Lynchburg. Many of the functions of the Vines Center, which houses men’s and women’s basketball games, could one day be transferred to a regional civic center, which is currently being considered with Liberty as a primary customer. Recently, the university has placed more emphasis on its club sports programs, which allows a greater number of students to participate in athletics competitions with students from other major U.S. universities and colleges. With more than 6,000 contiguous acres at its disposal, Liberty hosts some of the most unique recreational sport facilities of any college in the country, including an indoor skating rink, an indoor track, an indoor soccer center and a year-round ski slope on nearby Liberty Mountain. Earlier this year, Falwell announced plans for a $120 million upgrade to Liberty’s academic and residential campus over the next several years.